Blain Curtis’ field of dreams started in Memphis on the diamond of Christian Brothers University. Before he was eligible for Kindergarten at Tipton-Rosemark Academy, Curtis became a fixture at Buc Baseball games cheering on his uncle Zac Scott. Now Curtis plans to resume his days of running the bases at CBU after signing a letter of intent Nov. 22 on the TRA campus. Scott was a standout at CBU from 1998 to 2001 winning a Gulf South Conference Player of the Year award. Curtis hopes to follow in those footsteps. But the TRA Rebel senior is just happy to have the opportunity to play on the next level after a tough recruiting process. With record-breaking numbers for TRA, Curtis received interest from several Division I programs. “He’s always been told how small he was,” TRA Head Coach Brad Smith said. “We can’t lie about his size. He is what he is. He’s 5 foot, 7, give or take. When he swings the bat and plays the game of baseball, he plays to a 6’2 level. According to Blain’s parents Ashley and Sean many colleges were impressed with their son’s numbers and skills. But they cited his height as the reason they wouldn’t offer. When things looked bleek, Sean kept encouraging his son. CBU Head Coach Phil Goodwin, who is familiar with the TRA program signing players like Cale Alexander and Jordan Wilson, was ready to give Curtis a chance. “It’s pretty relieving because I was pretty stressed,” Curtis acknowledged. “Early in the month when nobody had really offered me, I got stressed. But now it’s pretty relieving. I’m so excited. Curtis said the encouragement of his parents and family helped him in recent weeks during the recruiting process. But it was members of the Class of 2012 who paved the way for Curtis on how to handle reaching the next level. Curtis had plenty of role models within the TRA Baseball program in recent years. 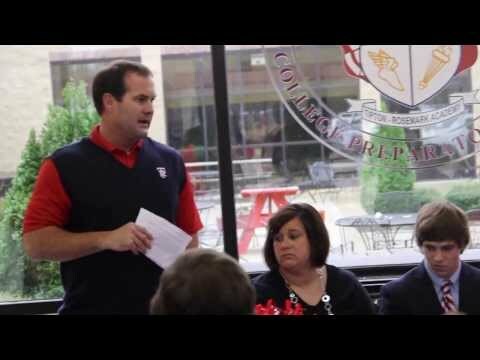 Under Coach Smith’s guidance, nine previous Rebels signed letters of intent. Curtis made it No. 10 and along with classmate Connor Alexander, they gave TRA it’s first duo to sign during early signing period. While Alexander’s arm earned him a scholarship to The University of Memphis, it was Curtis’ bat that opened the door for him to play college baseball. The 5-foot, 7-inch speedster has been one of the leaders in batting average the last two seasons helping TRA reach the 2012 State Tournament. Last season Curtis batted .389 with nine doubles and a homer. He added to his school record in triples with three. With 37 hits, Curtis also stole 20 bases. Reaching base 32 times on walks, Curtis scored 45 times in 33 games. Smith said numbers like that make it easy to overlook the numbers underneath height on the stat sheet for Curtis. Curtis has the school record for triple in a season and career. His path toward setting Rosemark records started officially in Brighton at the age of 4. After stops for youth league teams in Covington and Jackson, Curtis sharpen his skills with the Memphis Tigers traveling team. But Ashley said the entire process to CBU began at CBU. Sean said the signing day is not only a happy day for the Curtis family. “It’s a good fit,” he said. “And it’s all about education. He’ll definitely get a good education. If he plays hard there and keeps overcoming adversity, you never know. Curtis said before he steps foot on the CBU campus as a student, he wants to take care of business for the Rebels. Smith said he knows his consistent leadoff hitter will be a key contributor in 2014 for TRA. And he knows he will continue to play big once he arrives at CBU.